Breath of the Wild might be the hardest Zelda since the NES days, teaching players how to progress through its puzzles by killing them frequently and without remorse. Yet, paradoxically, it’s also one of the best games for people who don’t play a lot of video games. Last week, having spent the past month raving about the new Zelda to my fiancée, I offered to let her try it. She doesn’t play or care about video games outside of the occasional bout of Mario Party 2 (the best one) or whatever time-waster is currently on her phone. 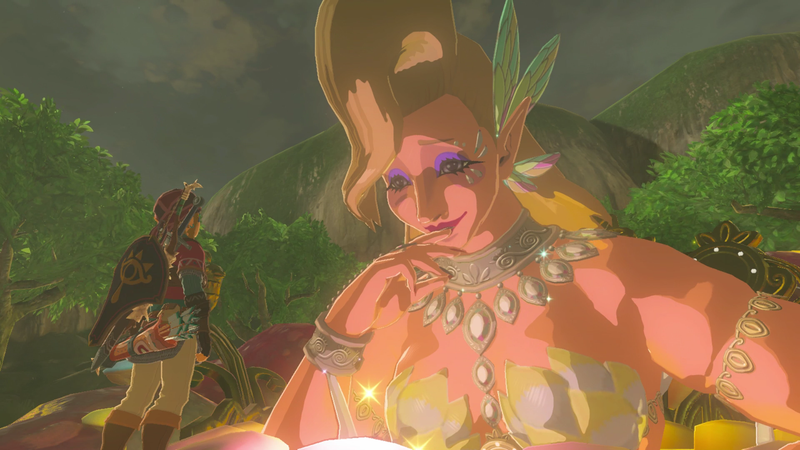 But she does remember spending some quality time with Ocarina of Time back in the day, so given that Breath of the Wild is one of the greatest games ever made and achieves much of what Ocarina of Time set out to do, I figured it might be up her alley. I set her up with the Switch—in handheld mode, so I could play Persona 5, which my fiancée describes as “that high school game” and “sort of like one of those terrible CW dramas I can’t stop watching”—and gave her a quick run-through of the controls. I explained that she should equip the clothing she’d picked up in the opening cave, then I showed her that she could climb on almost any wall in the game. Then she got out into the world and I told her, feeling like an E3 spokesman, that if she saw something, she could go there. And then my fiancée, who is brilliant and beautiful and perfect in every way, decided that her next move should be to make Link walk off the cliff, sending him plummeting to his untimely death. “Oops,” she laughed. After watching her play for a little while (and guiding her through some of the more video-gamey stuff), I figured my fiancée might play for an hour or two and then get bored, like when I tried to get her into Final Fantasy VI. (I have a bad track record when it comes to getting people into JRPGs.) I thought she might get frustrated by Breath of the Wild’s punishing enemies and tricky puzzles, to the point where she’d just turn it off after a few minutes and go back to Gilmore Girls. Readers, my fiancée played Zelda for seven hours straight. Her biggest stumbling block has been dual-stick controls—for some reason, inexperienced gamers always have a lot of trouble controlling the camera while moving—but once she got the hang of Breath of the Wild’s rhythm, my fiancée couldn’t stop playing. Dying in this Zelda doesn’t feel punishing or frustrating; it feels like a learning experience. And pretty much anyone can get that continuous thrill of discovering new areas, cooking up plates of mushrooms, and figuring out all the ridiculous things you can do thanks to what the makers of Breath of the Wild call the “chemistry set.” Now she can’t stop playing, to the point where I’ve had to take the Switch to work with me so she can actually be productive during the day. If you have a friend or family member who isn’t a big gamer, or if you yourself aren’t really into gaming (maybe you just read Kotaku for the pictures? ), The Legend of Zelda: Breath of the Wild is the game for you.